Traditional, yet cosmopolitan and packed with world-class attractions, it is of no surprise that London is such a sought-after vacation destination. Carlton Court’s beautiful apartments are the perfect base from which to discover the best that this diverse and vibrant city has to offer. Each one of our apartments are fully managed onsite and conveniently located in the heart of London. Our comfortable apartments combined with 24/7 security and concierge services, make us the ideal place if you are looking for vacation rentals in London. Hotels serve a purpose, but when it comes to comfort, space, privacy and better value for money, nothing beats our apartments. You can choose from 1, 2 and 3 bedroom apartments that all feature separate living and dining areas with en-suite bathrooms. This means that living in any one of our apartments will give you more space to work and play. Since our apartments are spacious and furnished with lavish sofas and comfortable beds, you can be sure that it meets all your high standards. By choosing one of our central London vacation rentals, you can live exactly the way you would if you were at home. 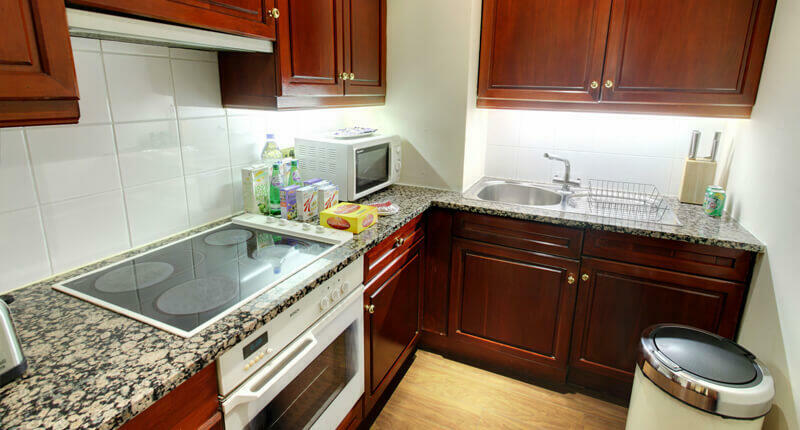 Our apartments come with fully-equipped kitchens where you can prepare a meal of your choice. You will not only be eating healthy when you want, but also saving money by not having to order takeouts or going to restaurants throughout your stay. To ensure that you get a home away from home feeling, we have equipped our apartments with high-definition LCD TVs, music systems and high-speed free Wi-Fi. Our TVs come with full Sky HD that runs more than 2,000 channels in various languages English, Hindi, Arabic, French and Russian. Whether you want to relax on the couch watching a movie or want to indulge in video calling with your friends, we have all the facilities you need.